Tonklyn stood on a large balcony, jutting out from halfway up the side of a mountain. Really, to say the balcony was large was really an understatement. It was easily thirty to forty feet wide, and it jutted out over the mountainside at least twenty feet in a sweeping half circle. The light glowing from the oculus at the end of his staff barely chased the dark from the balcony’s edge, enhanced a bit by the moonlight. There was no ledge or railing, just a stonework masonry floor, and then a steep and fast drop down the side of the mountain. Below the balcony were crags still full of unmelted snow, spotted with trees. Tonklyn stood a safe distance from the edge, but not against the mountainside opposite the drop off, or particularly close to the gaping open mouth of a corridor carved into that mountain. The night breeze was cold. It was the late spring, of course, but at this altitude, the air was still winter. His heavy dark brown robes and hood kept him relatively warm as he waited. It was a clear night, with lots of stars, and an almost full moon. The view of the forest at the valley floor below him was stunning. His eyes, however, were up in the air, scanning, looking, watching. The balcony was built just at the timber line. There were trees below, but above him only rocks and mountain, except for two other constructions, watchtowers jutting upward out of the mountain on either side of the balcony. The wind blew stronger for a moment, and he drew his hood and cloak tighter, though his breath still formed a mist in the chill before him. He caught sight of a motion in the air far off to his right, and his eyes focused on it immediately. It swept across the sky, silhouetted before the moon. He stepped forward and stood a little taller. As the shadow turned in the air, he raised his staff and waved it from side to side. It grew larger as it drew closer, and it came quickly. It dropped down, and for a moment was out of sight. Tonklyn could hear the heavy flapping of huge wings and felt the wind sweeping up from the trees below. Suddenly the balcony was enveloped in shadow as a massive dragon swooped up over the edge, waving its wings to both stop and steady itself. Its neck arched over and its head looked across the balcony, finally focusing on Tonklyn, whose cloak was waving fiercely in the torrent created by the wings. As the wings drew back and up for another stroke, its back legs, easily as long as Tonklyn was high, reached down and settled onto the edge of the balcony. The muscular body was covered in skin of deep black scales with a slight tint of red reflecting on the underside. The wingstroke came, though not as hard as others, and the forelegs reached out and landed on the stone floor. 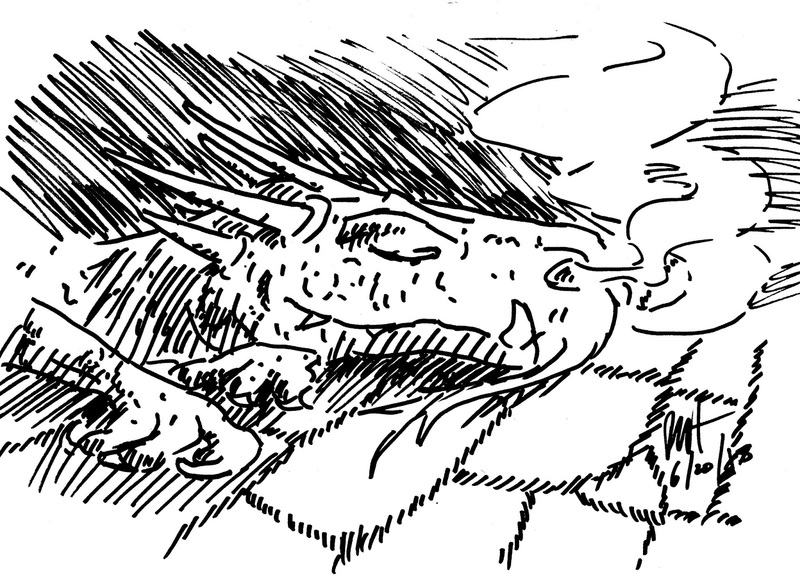 The dragon leaned back on its back legs and lifted up its head. It stretched out its wings and shook them before folding them neatly across its back. It swayed its head from side to side as if to work its muscles, and finally looked at the human. “Certainly.” They stepped from the corridor into a large open chamber with a high ceiling supported by pillars all around, each with a dimly glowing oculus. In the center of this space was a vast round carpet of soft furs and blankets. 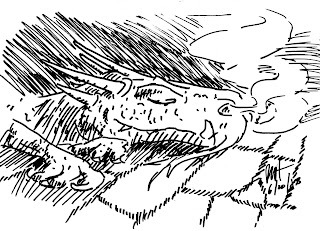 The dragon strode in and circled himself onto it and settled down, with his head up and alert.